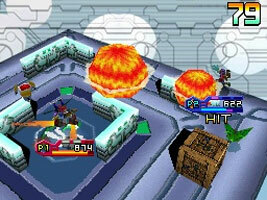 After transferring to a new town, a young boy joins the Custom Robo battling group, "Team Numero Uno". He shows off his talent for when forced to face the Grapple Gang. Together, you and the team aim for the Robo tournament at the top of Mt. Zephyr, but along the way, one of your teammates awakens the illegal Robo Hadron. Customise your miniature Robos and send them into battle. Use your weapons and stage cover to reduce your enemy's Hit Points to zero within the time limit. The new Soulboost technique allows your Robo to become stronger for a short time. You can also play multiplayer battles wirelessly or over the Nintendo Wi-Fi Connection.